ARCASHADE will protect against sun and glare in dry hot weather and restore light transmission in damp weather. An alternative to lime based whitewashing which must be applied on a regular basis during hot weather and is difficult to remove at the end of the summer, ARCASHADE will last up to 7 months and fade off naturally at the end of the summer or with the onset of the autumn rains. 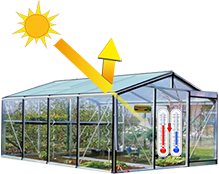 ARCASHADE will protect the interior of the greenhouse from glare and intensity of sunlight,high temperatures and humidity. Ideal in very hot climates, ARCASHADE is used with success throughout northern Africa. But even in the British summer, the sun through the glass can raise the temperature within the greenhouse to unacceptable levels and scorch new cuttings and freshly potted plants, seedings and a wide variety of plants and flowers. It is essential that a fine balance of shading and humidity be achieved. Depending on the rate of dilution, its formula will shade more or less, allowing more or less light transmission which makes it ideally suited to your specific needs. Applied early spring it will lower greenhouse temperatures during the warmer spring and summer growing seasons. Under standard application and weather conditions in hot climates (>35°C), : a decrease of 2 to 3°C . 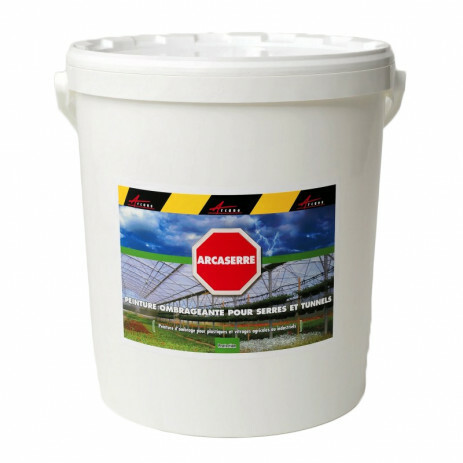 Dedicated to sustainable development, ARCANE INDUSTRIES has been involved in the research for finding alternatives to lime and has developed ARCASHADE to meet strict safety and health standards and ensure minimal impact on the environment. 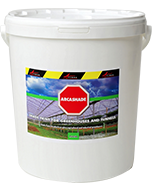 ARCASHADE is a very efficient and environment friendly shade paint for seasonal shading of agricultural or industrial greenhouses. Applied early spring it will lower greenhouse temperatures during the warmer spring and summer growing seasons. Arcashade will fade off and disappear with end of the summer or early autumn rains. Ensure optimal results on glass or plastic greenhouses by using our weather sensitive greenhouse shade paint. ARCASHADE is designed for seasonal shading of industrial and agricultural greenhouses. Easy to use, ARCASHADE allows variations in the intensity of shade obtained depending on the rate of dilution. ARCASHADE is an ideal alternative to lime based whitewashing which must be applied on a regular basis during hot weather and is difficult to remove at the end of the summer. ARCASHADE will last up to 7 months and fade off naturally at the end of the summer or with the onset of the autumn rains. The degree of dilution and number of applications are adapted to the local weather conditions (intensity of sunlight and temperature) upon application and the nature of the plants to be protected. Do not apply in humid or close to freezing temperatures (<5°C). Optimum performance is achieved by using the right combination of products, surface preparation and application procedures. 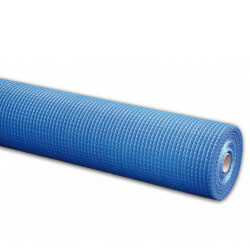 Surface preparation is extremely important to ensure proper adhesion of the product. 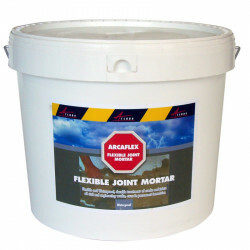 Use ARCACLEAN to clean the surface of all old paint residue, dirt and dust. Apply with airless spray or spray gun, adjusting the nozzle so that the product is sprayed evenly. ARCASHADE can be sprayed using a tractor equipped with tanks and rotary atomizers or even from a helicopter to cover very large surface areas. The pressure must be 10 to 17 bars (adapted to the type of sprayer being used) and the product should be sprayed no more than 1M away from the surface to be covered. We recommend passing over the same area two or three times to guarantee that the surface is covered totally and regularly. 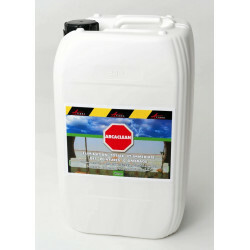 Dilute according to the degree of shade desired (average dilution: 4 to 6 L water per kilo of ARCASHADE. Once the product and water are well mixed, spray on the surface without delay.with a paint brush, lambswool roller or airless spray gun. We recommend using a spry gun equipped with a nozzle 0.16mm to 0.63mm, classic ball pump piston, ratio 45/1 to 61/1, pressures up to 120 bars. Note: refer to product data sheet for ARACACLEAN before using. Diluted 5 to one, 25kg ARCASHADE + water (5x25) will render 150 kg of product which will cover an average area of 1000m2 (between 750 and 1500m²). Dry to touch at 20°C: 2 hours . This is approximate and will depend on the temperature and relative humidity.